ALPLA sustainability days: understanding and supporting customers - Pzwei. Pressearbeit. Vlotho‐Exter, 15 June 2018 – ALPLA, the Aus­trian packa­ging solu­tions spe­cia­list, held the first sustai­na­bi­lity days at its Vlotho‐Exter loca­tion. 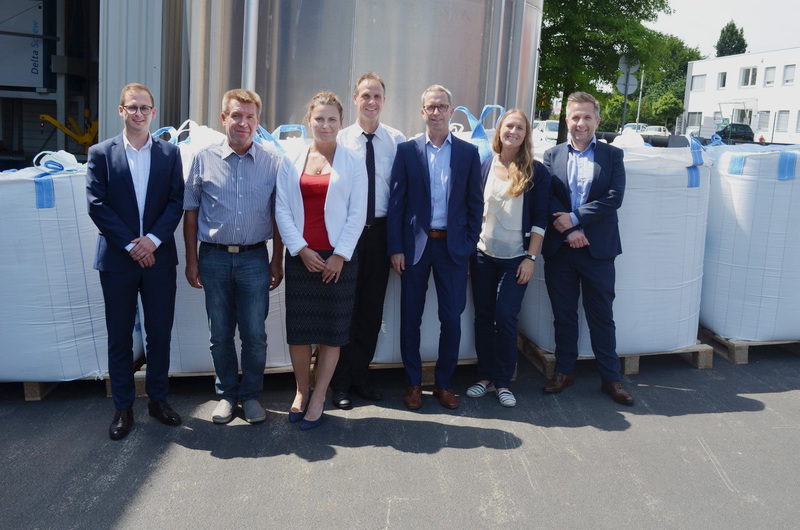 Over two days, plastics experts and sustai­na­bi­lity offi­cers wel­comed around 20 customer rep­re­sen­ta­tives for indi­vi­dual dis­cus­sions. The plastics industry, and the packa­ging industry in par­ti­cular, is cur­r­ently facing major chal­lenges: it’s not just con­su­mers who are increa­singly voci­fe­rous in deman­ding sustainable pro­ducts. Legis­la­tion on an European and national level is also paving the way for a cir­cular eco­nomy. ‘This change affects the entire value chain. In order for us to be able to sup­port custo­mers in their sustai­na­bi­lity stra­tegy, we have to under­stand their expec­ta­tions,’ exp­lains Georg Pescher. As plant manager, Pescher’s role involves mana­ging the Vlotho‐Exter loca­tion. Along­side his col­leagues, he intro­duced the first ALPLA sustai­na­bi­lity days. Selected customer rep­re­sen­ta­tives received ques­ti­onn­aires in the run‐up to the event. ‘Our aim was to find out how important sustai­na­bi­lity is to our custo­mers. But we also wanted to find out what changes they expect as a result of the new legis­la­tion,’ says Pescher. The results speak for them­selves: recy­cling, alter­na­tive mate­rials such as bio‐based plastics, and the reduc­tion of CO2 emis­sions were some of the most popular topics in the indi­vi­dual dis­cus­sions. ‘Sustai­na­bi­lity is no longer a pas­sing trend or merely a mar­ke­ting tool. It is an important issue for all our custo­mers. We are expec­ting a lot of exci­ting pro­jects in this area,’ says the plant manager. ‘The EU’s plastics stra­tegy and the new packa­ging legis­la­tion require a higher rate of recy­cling in plastic packa­ging. ALPLA has been working with recy­cling for over 25 years. Our many years of expe­ri­ence in pro­ces­sing recy­cled plastics is now very wel­come to our custo­mers,’ says Pescher. ALPLA ope­rates three of its own recy­cling plants, in Aus­tria, Poland, and a joint ven­ture in Mexico, with an ope­ra­ting capa­city of 65,000 tonnes of food‐grade rPET each year. The majo­rity are recy­cled into new bot­tles in the spirit of the cir­cular eco­nomy. ‘Recy­cling tech­no­logy is now so advanced that our col­leagues at the Wöl­lers­dorf loca­tion can pro­duce recy­cled PET with just a tenth of the green­house gas emis­sions of new PET pro­ducts,’ exp­lains Pescher. This enables the recy­cling industry to make a major con­tri­bu­tion to achie­ving global CO2 tar­gets.